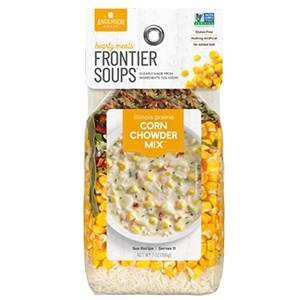 Frontier Illinois Prairie Corn Chowder is one of our top Sellers! A luscious and versatile family favorite! (When fresh corn is available, cut the kernels off 2 or 3 cobs and set aside. Add cobs to the broth with the potatoes and continue with the recipe. 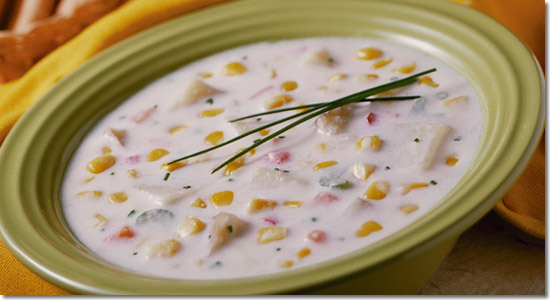 Remove cobs and add the fresh corn with the cream.) For meatier chowder, add diced chicken breast, crabmeat or clams. Peel and dice potatoes and place in a 4 quart pot. Add contents of Illinois Prairie Soup Mix and simmer, covered, for 45 minutes. Add cream and heat, uncovered, on low until slightly thickened about 15 to 30 minutes. With a garnish of grated Monterey Jack cheese and fresh parsley, this soup makes a lovely summer or winter meal! Add 1/2 pound each of scallops and peeled medium shrimp after adding the cream for last ten minutes of cooking time. Optional: When fresh corn is available, cut the kernels off 2 or 3 and set aside. Add cobs to the broth with the potatoes and continue with the recipe. Remove cobs and add the fresh corn with the cream. For meatier chowder, add diced chicken breast, crabmeat or clams. Peel and dice potatoes and place in a slow cooker. Add chicken broth and contents of Illinois Prairie Soup Mix. Cover and cook on LOW for 8 hours. Add cream and any optional additions, stir and continue to cook 1 hour on HI. Remove bay leaf before serving. Fantastic soup! I added 6 Yukon gold potatoes since we love potatoes. Also threw in a combo of white and yellow frozen sweet corn. After adding the heavy cream, I also added cooked shrimp just to warm through and then a half cup of cream sherry. This sent the soup over the top! Tasted even better than the seafood bisque we order at a local top of the line Italian restaurant! Thank you for making this wonderful soup available! Best soup I ever made! Loved it and would recommend it to everyone. This soup was thick and creamy! Yummy! This is one of those soups that you keep wanting to eat long after you are full! I made this mix for a gathering along with five other soups. All of them were very good, but this one disappeared the fastest. Perfect for a spring or summer soup, I will definately toss in some fresh off the cob sweet corn next time to improve on the perfection that is this soup!